Loafers Delphinium slippers from Free Fish. Post Grey slippers from Bedroom Athletics. Cream Moonrock slippers from Bedroom Athletics. Boot Charcoal slippers from Bedroom Athletics; Rubber Sole. Slide Grey slippers from Bedroom Athletics. Trace Grey slippers from Bedroom Athletics; Rubber Sole. Artic Wolf slippers from Bedroom Athletics. Black Leather slippers from Office. Black Croc slippers from Office; Synthetic Sole; Leather Sock; Leather Lining. Black Suede slippers from Office; Leather Upper; Synthetic Sole; Leather Lining. With Embellishment slippers from Office. Croc Leather slippers from Office; Leather Sock. Silver Leather slippers from Office; Leather Sock. 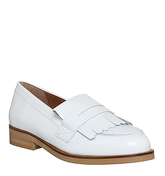 Patent Leather slippers from Office; Leather Upper; Synthetic Sole; Leather Lining. Burgundy Suede slippers from Office. Grey Leather slippers from Office; Leather Upper; Leather Sock; Leather Lining. Bhunni Rose slippers from Ted Baker. 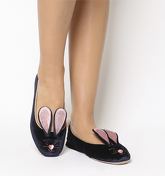 Bhunni Navy slippers from Ted Baker. Black Suede slippers from Office; Synthetic Sole; Leather Lining. On this site you will find ladies slippers in sizes from 3 to 8. There are 25 pairs of shoes starting with price of £7,50; 17 pairs from the whole collection are discounted at this moment. There are 6 brands, most of shoes comes from Office, Bedroom Athletics, Ted Baker, UGG Australia and Free Fish. The shoes are available in different colours, mostly in Black, Grey, Silver, Pink and Blue.